those sunnies are perfect! loving that style lately! I love that you're going for such bright colours! I hardly ever wearing yellow and orange, but now I really want yellow sunglasses! 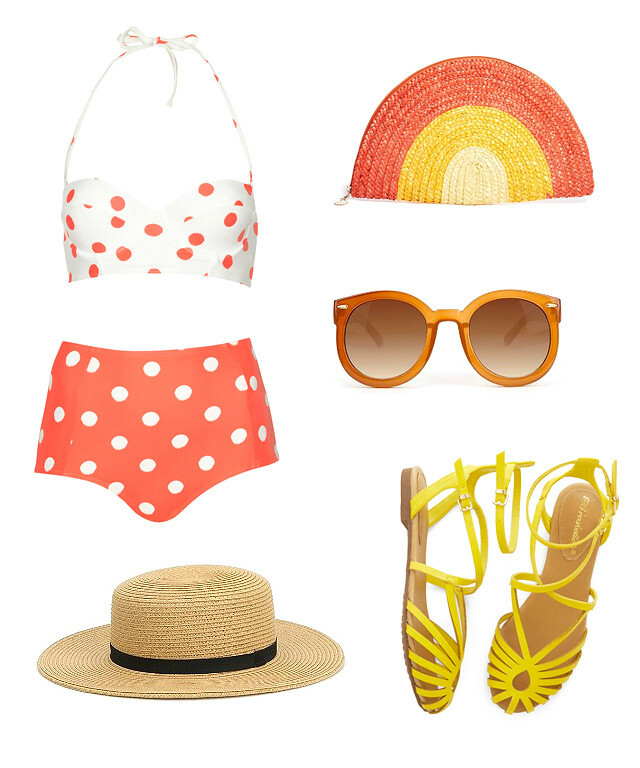 Love this summer wish list - especially those sunnies! I have -0- dollars at the moment but when I do... I would love one of those suits and those sunnies for my trip to Anaheim in August! I love summer travel! I'm excitedly going on two trips this summer, and I have enjoyed the hunt for the perfect travel clothing. I can't wait for it all to begin! Where are you traveling to? I love that hat & swimsuit! So cute! I can't wait for summer to get here already so I can be in the sunshine!! All warm colours for summer! so fun! love that suit. I had that swimsuit on a bathing suit list I did for my blog too! I actually just ordered it and a couple of other high waisted bikinis from Topshop to try out. Can't wait to get them in the mail! Ahhh those sunglasses! I want them in every color! OMG I love this selection!!!! that swimsuit is seriously perfect. how do you make collages like this? i keep seeing them everywhere but i can't figure out how to make my own! ah! In love with the bag!! Perfect for my summer travels! Cool summer attire. Perfect match for the cool and hot summer. I love summer. the bikini is just perfect! there are not a lot of highwaist bikinis that look so adorbale. the highwaist bikinis from Topshop are so cute!